The adults feed on the foliage of various trees and shrubs. Each species seems to prefer a different set of trees. The larvae are white grubs that can damage turf. The adults emerge from hiding places in the soil or turf at dusk. 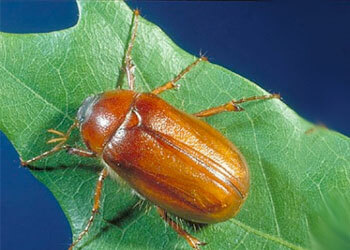 These adults fly to trees where they mate and feed by making small irregular holes in the leaves. If this feeding occurs when the tree leaves are still expanding the small holes may increase in size and cause the leaves to have a general tattered look. This is most common on oaks and maples.